Your first, and probably second and third, visit to The Netherlands will take you straight to Amsterdam. Simply because it’s easy (and cheap!) to get to Amsterdam and because the city has such a thrilling image. I won’t deny that. Amsterdam is absolute magic. But if you’d like to explore Amsterdam beyond the famous sights and avoid the hordes and hordes of tourists that have been flowing into the city the last couple of years, this alternative guide to Amsterdam is for you. Even as a Dutch person I understand the attraction Amsterdam holds over foreign visitors. Since I don’t live in Amsterdam but get to visit regularly for work, I feel that overwhelming sense of Dutch pride when I see the Golden Age canals of our capital, lined by gabled houses and gazillions of bikes locked to their railings. 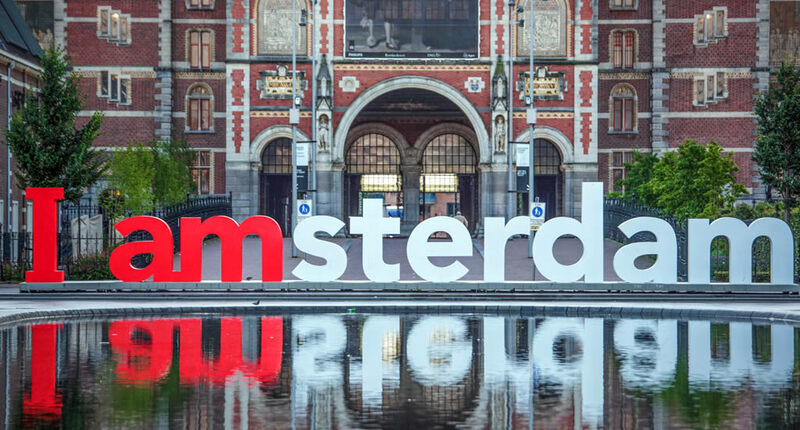 Amsterdam city centre may be compact, but it’s grand when you think of the thousands and thousands of treasures on display in the museums, dozens of shops selling high-end Dutch design and the vast number of excellent restaurants. The downside is that lots (and I mean lots) of people feel this attraction to Amsterdam and tens of thousands of tourists have been flowing into the city yearly, more often than not clogging (no pun intended!) the narrow streets of the centre, resulting in long queues for famous sights and mediocre eateries with tourist menus popping up all over town. I am not trying to discourage you to visit Amsterdam but would like to offer a somewhat more realistic look. That’s why I think that combining famous Amsterdam sights with lesser-known hotspots and a day trip or two to the Dutch countryside would be the perfect combination for a lovely and relaxing visit to Amsterdam. 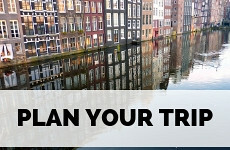 I hope this alternative guide to Amsterdam helps you plan your trip. You can find lucrative deals on plane tickets to Amsterdam from most destinations around the world. Landing at Amsterdam (Schiphol) Airport it’s easy to get into the city. You can either take the train, which takes about 15 to 20 minutes, arrange for a transfer with your hotel or take a taxi. When choosing the latter, make sure you hop into an official taxi (waiting at the official taxi stand), to ensure not being ripped off by an illegal driver. It’s easy to get around by food in Amsterdam as the city is relatively compact and a lot of sights are within walking distance. Before you cross the streets, beware of trams and bikes. Trams, metros and buses take you wherever you need to go in Amsterdam. You need an OV Chip Card, which you can charge as you go. This can be used for all public transport in The Netherlands. 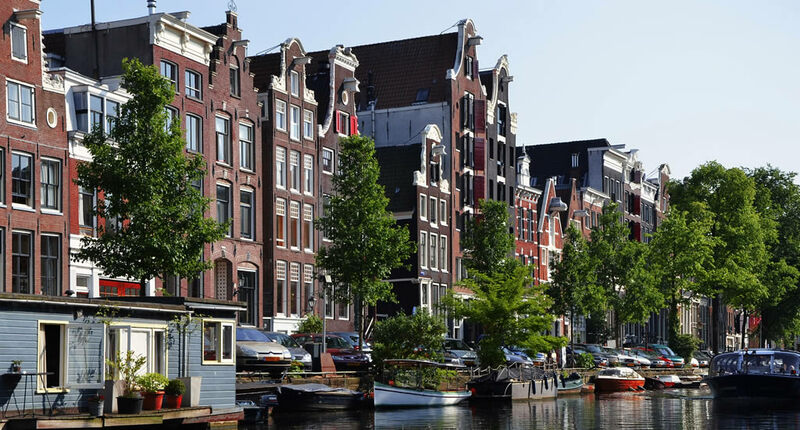 Alternatively, you can buy an I Amsterdam City Card which grants you access to public transportation, a canal cruise, Amsterdam’s top museums and attractions and day trips. Are you a little pressed for time? Only visiting Amsterdam for a few days? Then the Hop on hop off bus is for you. With your ticket you can hop on a bus to take you along some famous sights, but also two hop on hop off canal boats, taking different routes, for a special perspective on Amsterdam. If you’d like to visit NDSM island or Amsterdam Noord you can take the (free!) ferries departing from the back of Amsterdam Central Station. Some canals in Amsterdam are so narrow that you can only view them from the water by stepping on board a canal boat. 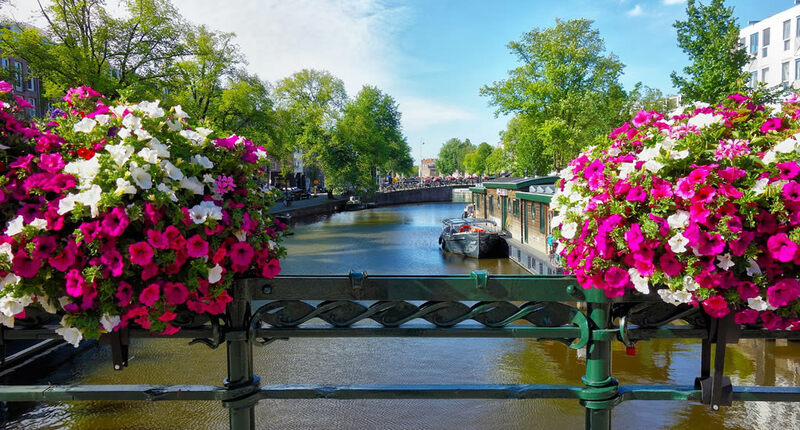 You can either choose to go on a standard canal cruise sightseeing or buy a canal boat hop on hop off ticket, so you can see all the sights in Amsterdam while using a canal boat as public transport. For a true Dutch experience, you can rent a bike or take a bike tour and explore Amsterdam by bike. This is one of the best ways to discover the city. But beware! We Dutchies cycle like maniacs (well, according to visitors, we think we’re very modest) and in Amsterdam the bike lanes and street are very crowded with bikes. If you haven’t cycled in a while, first read my advice on cycling in The Netherlands. For less than €10 a day you can rent a bike in Amsterdam. The rental bikes are very sturdy and come with locks (please, lock your bike in Amsterdam!). 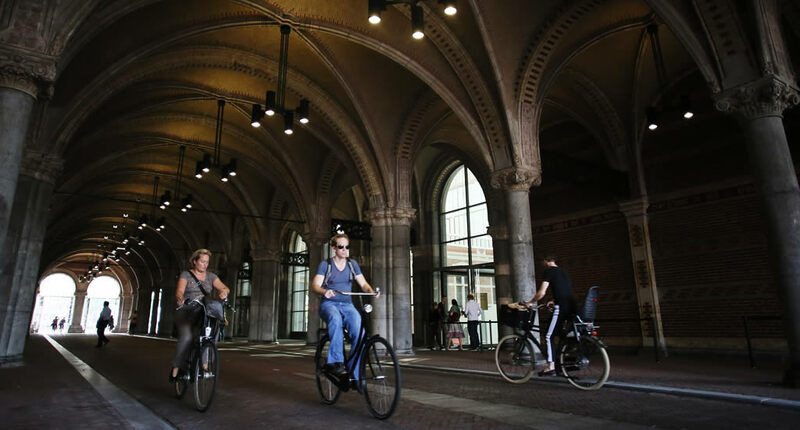 If you are pressed for time, but you’d like to see the best Amsterdam has to offer, this Amsterdam highlight tour by bike will be the perfect Dutch experience. In just 3 hours you will visit all the important sights of Amsterdam, as well as learning interesting background stories on the history of the city. 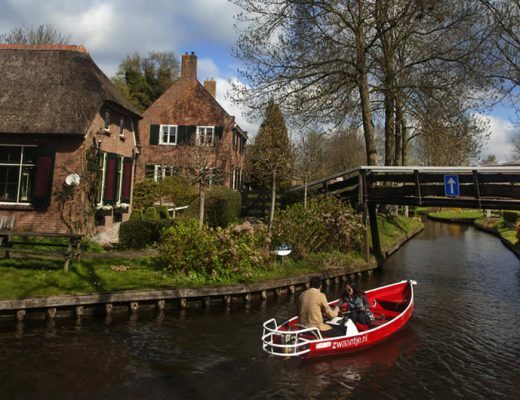 If you have a day to spare (or if the weather is very nice), book this bike tour to catch a beautiful glimpse of the Dutch countryside surrounding Amsterdam. After just 10 minutes of cycling out of the city centre, it will like Amsterdam is light years away. You will take the ferry and see beautiful areas like IJsselmeer ad Durgerdam. Not only will you see the best art Holland has to offer, from the Middle ages until present day, including all those amazing Rembrandts, Van Goghs, Vermeers and Ruysdaels, but a trip to the Rijksmuseum is like a walk through Dutch history, with amazing models of ships that used to sail the seven seas, fashion and a grand china collection. The Rijksmuseum is an absolute must-see and thousands of visitors, from Holland and abroad, come to visit this amazing museum every week. If you don’t want to stand in line: buy your ticket online. It’s one of the saddest stories that came from The Netherlands, and unfortunately, maybe also the most famous one. Anne Frank moved to Amsterdam when she was just a little girl and she and her family were arrested by the Nazis in this house at Prinsengracht, where they had been in hiding for over 2 years. To visit the Anne Frank house isn’t only a tribute to a girl that never made it back from the concentration camps, but more like a tribute to murdered innocence anywhere in the world. Rembrandt was a celebrity (albeit a poor and strange one) when he was alive and making art in the Golden Age. This can’t be said about Vincent van Gogh, who lived some two centuries later. He lived in the south of The Netherlands and France for most of his difficult and unhappy life and his brilliance was only seen by his brother Theo, who bought Vincent’s paintings out of pitty. It’s hard to imagine while you walk through the Van Gogh Museum and see all those brilliant works. From the dark and gloomy farmers, he painted in Nuenen to the starry nights in France. If you buy your ticket for the Van Gogh Museum online, you can skip the long lines. 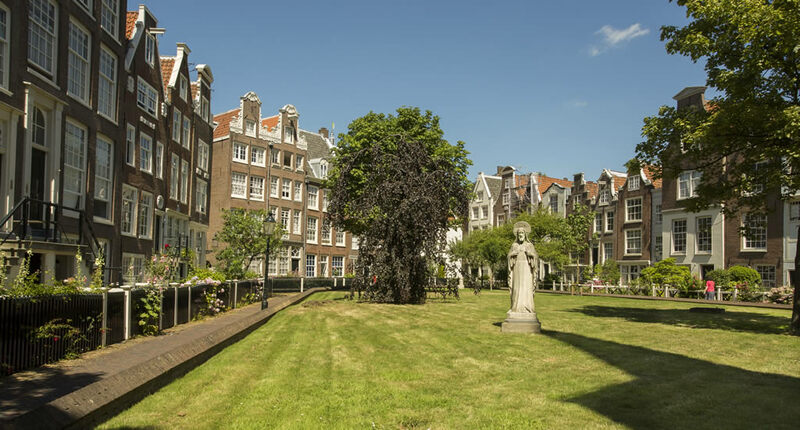 This excellent museum houses the collection of postwar curator Willem Sandberg and you will be sure to see contemporary works by Picasso, Mondriaan, Gerrit Rietveld, Van Gogh, Matisse and Warhol. The Stedelijk Museum is an absolute delight. No Dutch painter speaks to the imagination as Rembrandt does. The magician with light and shadow puts a spell on you, whenever you see one of his works. When you’re in Amsterdam, visit the Rembrandthuis where the artists worked when he was commissioned his most famous works. You can see the studio where he painted the famous Night Watch. Ever since Tsar Peter the Great learned all about shipbuilding in The Netherlands in the 17th century, there has been a close link between the Dutch and Russians. 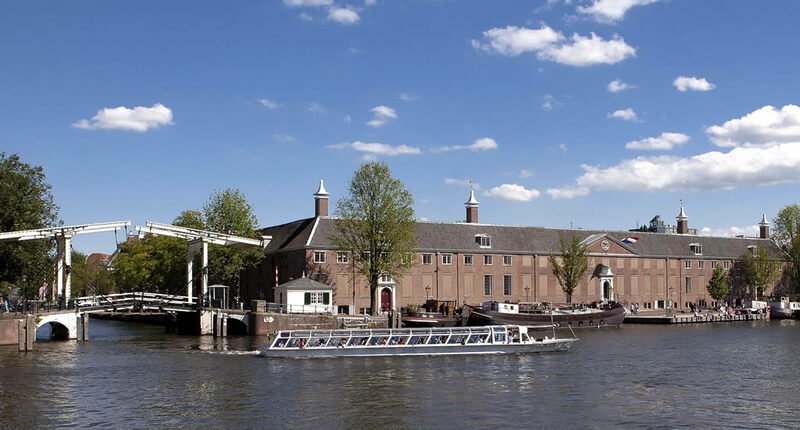 The Hermitage Amsterdam displays grand exhibits which have travelled directly from her big sister in St. Petersburg. Exhibits change every 6 months or so, but there is also the Golden Age portrait gallery to enjoy. Entrance is included in the I Amsterdam City Card. When you visit Amsterdam with kids, NEMO should be on your list for sure. The iconic building holds three floors of interactive exhibits which enables kids to learn all about the world around them. Though it makes science very accessible to adults as well. 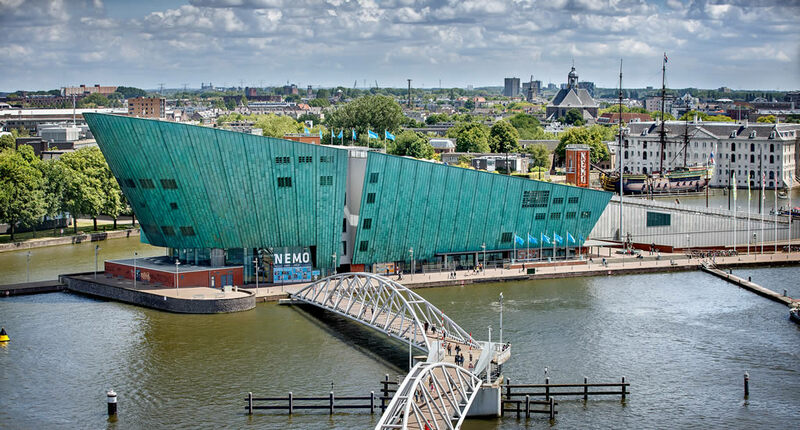 Entrance to NEMO is included in the I Amsterdam City Card. 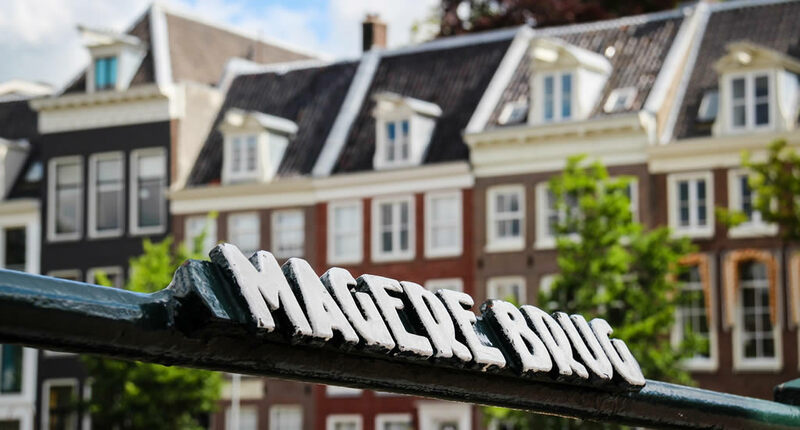 The museum of Dutch resistance brings the horrors of German occupation during WWII back to life and tells the stories about the local resistance and collaboration with the Germans. There is also a section on the Japanese occupation of Dutch East India (now Indonesia). This museum is also interesting for kids, as there is a special section of the resistance seen through the eyes of 4 Dutch kids. With almost 300 stalls Albert Cuypmarkt is Amsterdam’s largest and busiest open-air market. The vendors sell everything from clothes and shoes to vegetables and cheese. 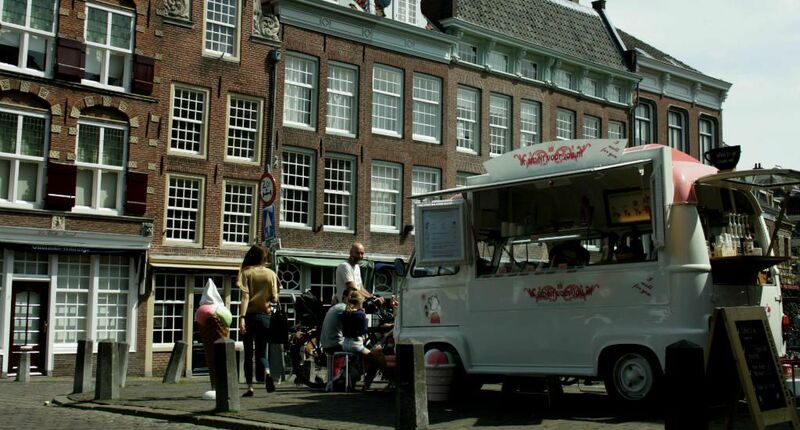 Albert Cuyp is the perfect market to taste some Dutch delights like poffertjes, frites and stroopwafels. The cafés surrounding the market are perfect to relax and have a drink. Don’t walk past this pretty canal house, as inside resides an excellent photo gallery. The spaces are large and light, which makes for a nice wander through the different temporary exhibits of world-famous photographers. 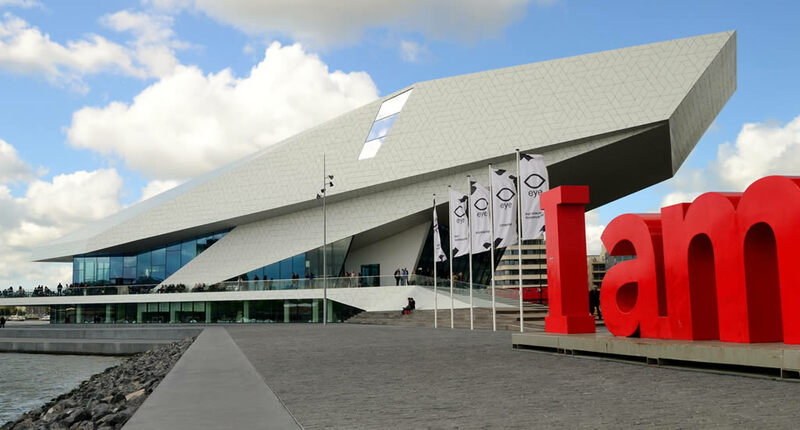 This gorgeous contemporary building resides on the banks of the IJ river and houses a film institute and a large cinema showing mostly art house movies. However, if you have the change, just go there for a drink or lunch on the terrace or in the pretty restaurant for an amazing view over the Amsterdam skyline. Take the free ferry to the peninsula that used to be the NDSM Wharf. This was once a shipyard, but it’s now an edgy and arty community, with cafés and restaurants in old sea containers and lots of street art. Hip festivals are often hosted on NDSM island. 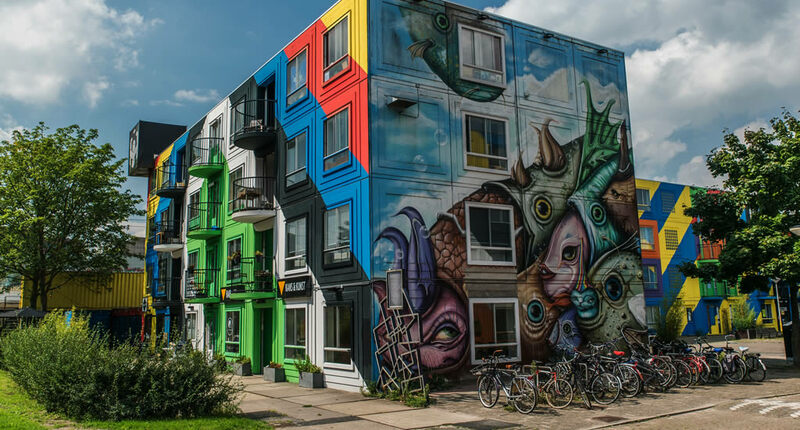 If you’d like to see some interesting street art in Amsterdam, it’s worth taking the Free Alternative Tour Amsterdam leading you through lesser-known parts of the city, showing you great murals and graffiti. The Moco Museum is set in a beautiful historical Amsterdam mansion and worth checking out. Especially after seeing all those grand old masters, the quirky contemporary and edgy exhibits of the Moco will be a nice change. Currently, Moco is hosting a Banksy exhibit which is absolutely great to see. 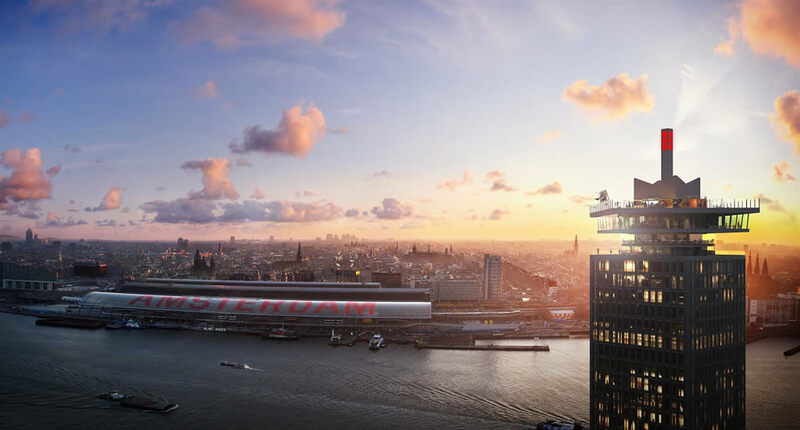 The observation platform on top of the A’DAM building is one of the newest hotspots in town. You can easily reach the Lookout by taking the free ferry at the back of Amsterdam Central Station. From the lookout, you can try out the swings (eek!) or simply enjoy the amazing view over the city. If you’re a big fan of Dutch cheeses a cheese tasting at Henri Willig should be on your list. In a little less than an hour you will learn all about the Dutch process of cheese making, whilst sampling 4 different kinds of cheese with mustard and dips. You can accompany this by a glass of wine or a beer by Dutch craft brewery Maallust. A quiet haven in the middle of the bustling city centre. This enclosed former convent dates back to the 14nth century and is a gorgeous green courtyard surrounded by historical gabled buildings. You can find the Begijnhof just off Gedempte Begijnensloot. I simply love the name of this museum (which translates into ‘Our dear lord on the attic’) and basically is an entire church inside an ordinary Amsterdam canal house. It dates back to the 16th century and was a Catholic form of protest against the Calvinists taking over in The Netherlands. Near Westerpark is this 19th-century complex which used to house the western city’s gasworks. The site was very polluted once the gas company closed, but after a huge clean up it’s now a recreational park with cafés, theatres and cinemas. The Cobra museum is the perfect excuse to escape the crowds. This canalside museum hosts art from the post-WWII movement Cobra, which is characterised by bold, colourful and avant-garde works. In the museum, there are pieces by Cobra key players Karel Appel, Corneille and Anton Rooskens. Hollandse Schouwburg (which translates into ‘The Dutch Theatre’) has quite the dramatic past. During WWII the theatre was the place where the Nazis rounded up Jews before sending them east. After the war, understandably, the building never went back to being a theatre. Nowadays it’s one of the most heartbreaking places of remembrance in Amsterdam, but also a place to read about extraordinary stories, like nearby working nurses who saved dozens of Jewish babies, whilst risking their own life. Another quiet haven in the busy city. This botanical garden has been here since 1683. Dutch merchant ships smuggled seeds and samples from their exotic destinations and nowadays over 4000 species can be found in this wonderful structure. The butterfly garden is amazing (and a big hot with kids). On a warm sunny day, while relaxing at Blijburg beach, you may dream that you’re in Thailand instead of Amsterdam. Blijburg has a relaxed and hip atmosphere and locals love hanging out here when the weather is nice. The Jordaan neighbourhood has the be the most famous quarter in Amsterdam, right in the centre of the city. And to me, this is where ‘real’ Amsterdamians are from (oh, that accent!). Once, this was a working-class bastion with people that had a taste for a drink or two and singing tearjerkers. Nowadays, the neighbourhood is quite a lot classier, but it still has that feel of real Amsterdam. Jordaan roughly lays in between Brouwersgracht and Leidschegracht. 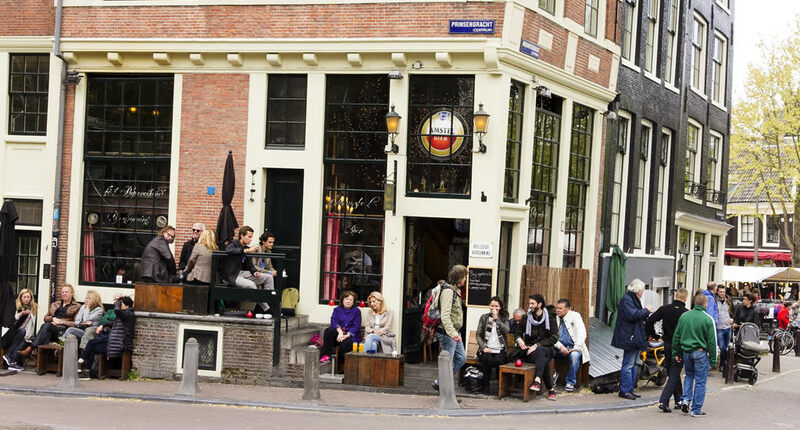 If you’d like to see the best of Jordaan, this culinary tour is an absolute must. 9 quirky streets (more or less around Noordermarkt) nudge up against Jordaan and are pretty touristy, but still offer some amazing independent designer and vintage shops, as well as cosy and hips cafés. Westerpark marks the line where Amsterdam West begins. Once, it was quite the industrial area, but it’s now home to a large park, the cultural hub that is Westergasfabriek and a lively neighbourhood full of street markets, hip restaurants and traditional Dutch cafés. I can’t recommend NDSM Wharf enough as a place to visit when you’re in Amsterdam. Lots of ex-industrial neighbourhoods have become total hipster hotspots, but NDSM still has the rough and dirty edges of its shipyard past. Lots of cafés and restaurants are housed in old shipping containers. 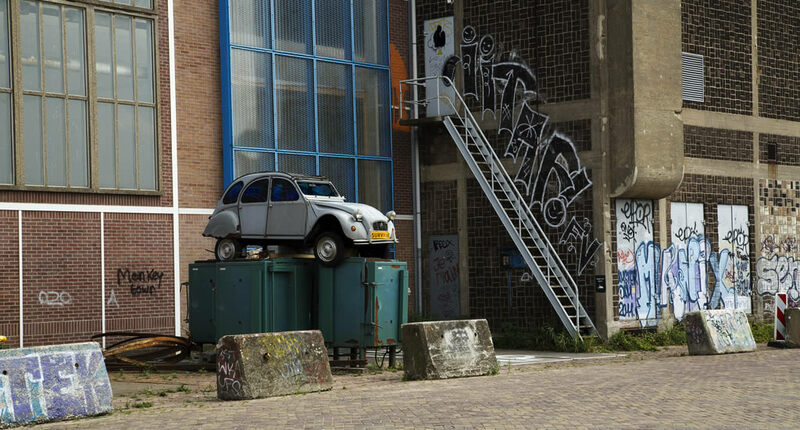 You can attend funky and grungy festivals almost every month and NDSM is a good place to spot some amazing street art. Taking the free ferry from Central Station is quite fun, as you can see the Amsterdam skyline from the water, which is pretty special. But the ferry will take you to Amsterdam Noord, an upcoming neighbourhood that has new hip cafés, museums and galleries popping up every week, but still has that quint and quiet atmosphere of a unique old Dutch village. This video shows accurately what’s to see in Amsterdam Noord. Amongst the most popular day trips from Amsterdam are day trips to tulip filled Keukenhof, the characteristical Dutch houses of Zaanse Schans and the scenic windmills of Kinderdijk. But honestly, everybody goes there and, especially between the months of April and October, you will find yourself surrounded by crowds and crowds (and then some busloads). 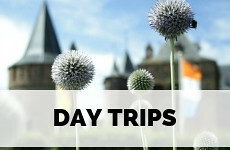 If you’d like to get to know The Netherlands a little better, these are some wonderful day trips to take from Amsterdam. When wandering the streets of Delft, along the winding canal, with glistening Delft blue vases peeping out behind the windows of the gabled houses, it isn’t hard to imagine what inspired Johannes Vermeer to create his paintings with a leading role for the city in which he was born. 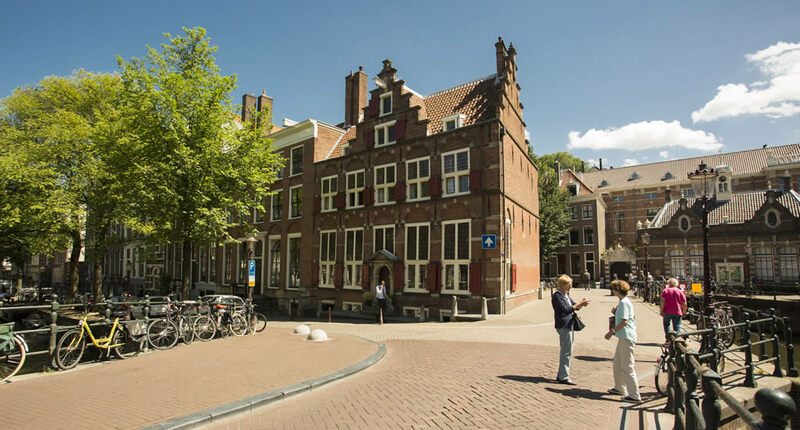 But a visit to Delft is also pivotal if you’d like to understand a little about The Netherlands, as it is in Delft where our Kingdom as we know it today, truly began. You can simply take a train to Delft, it takes about an hour. 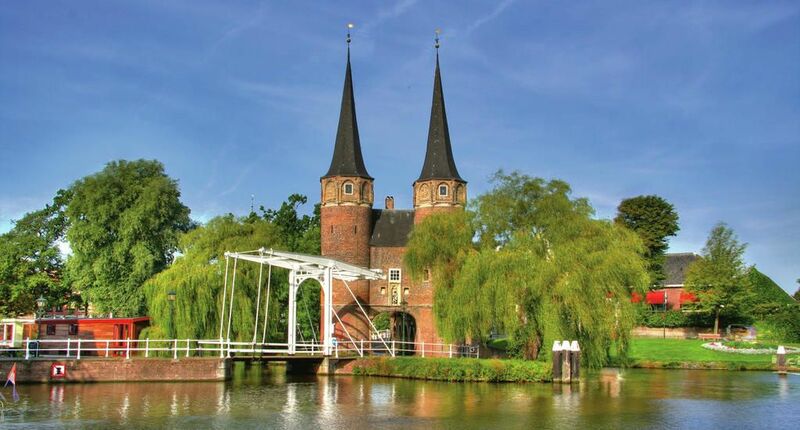 Read the city guide Delft about what to see and do. Utrecht is one of the oldest cities in The Netherlands and since it’s only 30 minutes by train in Amsterdam, Utrecht makes for a perfect day trip. However, since this is my hometown, I recommend you stay a day or two. To say that Utrecht is like Amsterdam without the crowds is selling the city short, for sure, but the comparison is understandable. Historical mansions line the canals of Utrecht, the windmills close to the city centre and the grand gothic Dom tower making for an ultimate Dutch experience. But please, don’t skip the great museums, Utrecht has several good ones, like Centraal Museum and Rietveld-Schröderhuis. But most of all, Utrecht was the birthplace of iconic little rabbit Miffy (or Nijntje, as we call her in Dutch) as her spiritual father was born and raised in Utrecht. 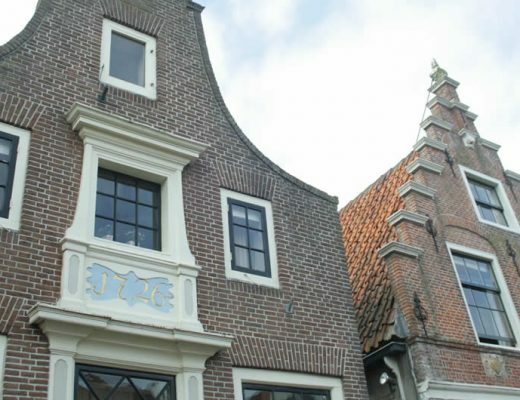 There is a Nijntje museum and you can see several tributes to the famous bunny in the city centre. 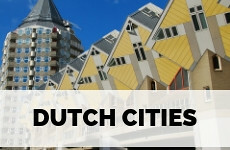 For all info, read my city guide Utrecht. I just looked it up and Lonely planet dares to call Efteling ‘the Dutch Disneyland’, which in all honesty: I find highly offensive. Efteling is a true Dutch institute and the finest theme park I have ever been to (but maybe I’m just being a patriot here). The theme park is set up in Anton Pieck style, with a beautiful enchanted forest where Grimm’s fairytales come to life. But adults will absolutely love the thrilling roller coasters and rides. 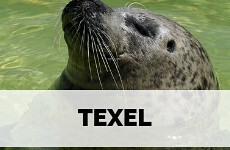 If you buy your ticket to Efteling online you get a discount and can skip the long lines at the entrance. Can you believe that when Amsterdam was still an insignificant village 9 cities in the east of The Netherlands were considered the most wealthy and prosperous of the country? This was all due to these cities being part of the Hanseatic League, making them important trading cities. Nowadays the 9 cities are modest to small, but the rich pasts still seep through the cobbled stones and gabled mansions in their centres. You can easily visit some of the Hansa Towns, like Zwolle or Deventer, from Amsterdam by train. But it’s also fun to take a road trip along the Hansa Towns. Did your visit to the Van Gogh Museum leave you with the indomitable desire to learn more about Vincent van Gogh and the remarkable life he lived? Seriously, that’s easy. Van Gogh lived in many places in The Netherlands and left a mark in most of them. 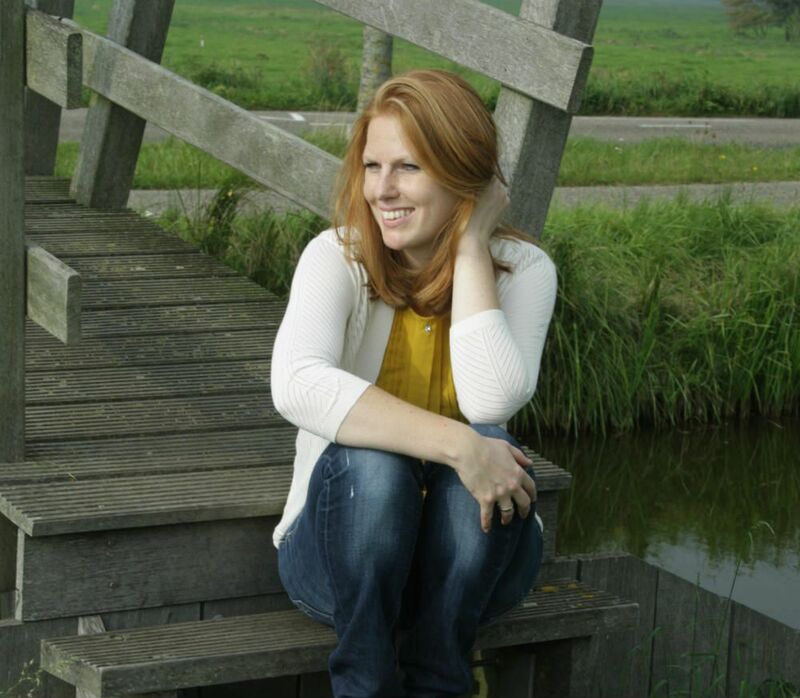 In my article Meet Vincent van Gogh in The Netherlands, I am letting you in on several places you can visit to learn more about this great master. With being less than 20 minutes from Amsterdam it would be a shame to miss Muiden on your visit to The Netherlands. 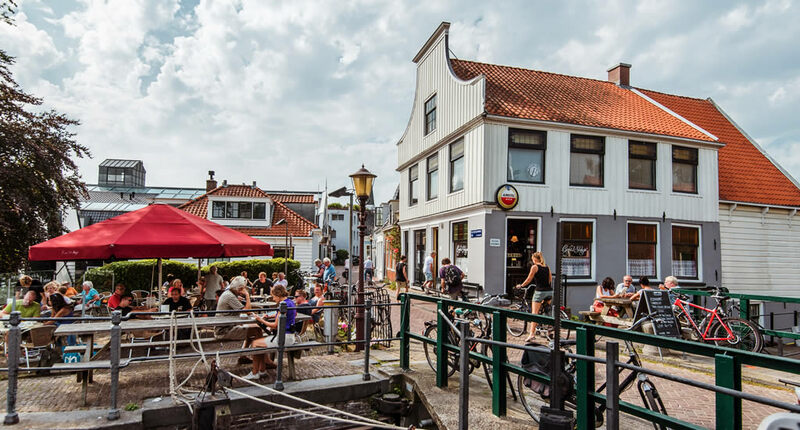 You can get there by ferry or by bus from Amsterdam, and Muiden makes for a lovely day trip. You can visit the island of Pampus to learn more about the Dutch fortifications and defence lines, wander the cute historical streets of Muiden and visit beautiful Muiden Castle. This has to be my favourite restaurant in Amsterdam. Take the (free!) ferry from Amsterdam Central Station to NDSM Werf and you’ll soon see Pllek: a restaurant housed in a structure of old sea containers. 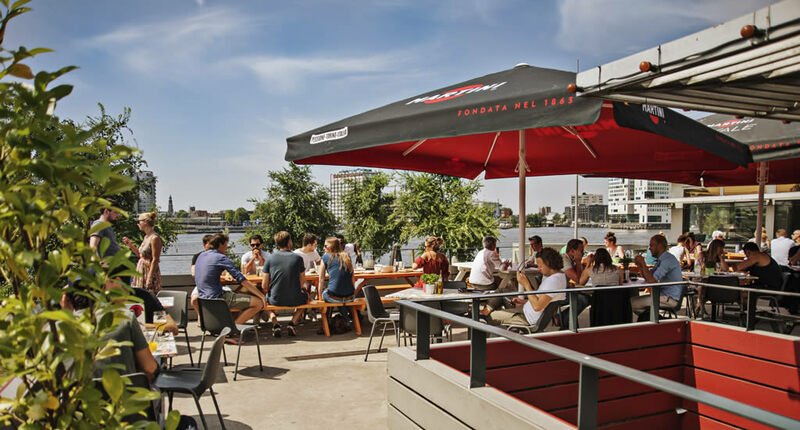 In summer the little beach in front of the restaurant is the perfect place to view the Amsterdam skyline whilst sipping a local beer. When it’s colder, the fire inside will keep you warm. The menu changes every few weeks. This modern en contemporary styled restaurant is also on NDSM Werf and you’ll see it as soon as you disembark the free ferry. It doesn’t matter if you’re in the mood for breakfast, lunch or dinner: IJ-kantine serves amazing dishes all day. In summer the Fruits-de-Mer are to die for. 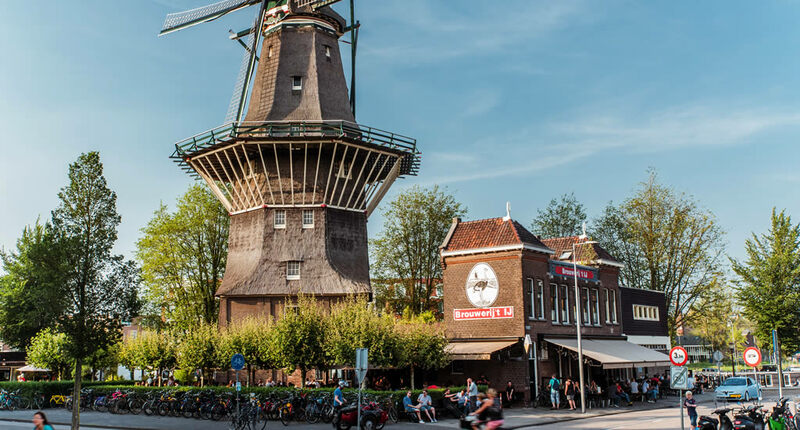 Breweries have been popping up all over Amsterdam, but ‘t IJ Brewery is probably the most well-known and since the brewery is set underneath a pretty windmill, it’s the perfect place to visit and sample some real Amsterdam beers. Take a tour around the brewery or sit outside admiring the fabulous view over the canal. It’s not the prettiest building in Amsterdam, but the fact that this was once the old Shell cafeteria makes it a fun place to visit anyway. Plus, the outdoor seating has amazing views over Amsterdam. In the evening it’s a great place for dinner too and there are gigs scheduled all the time. 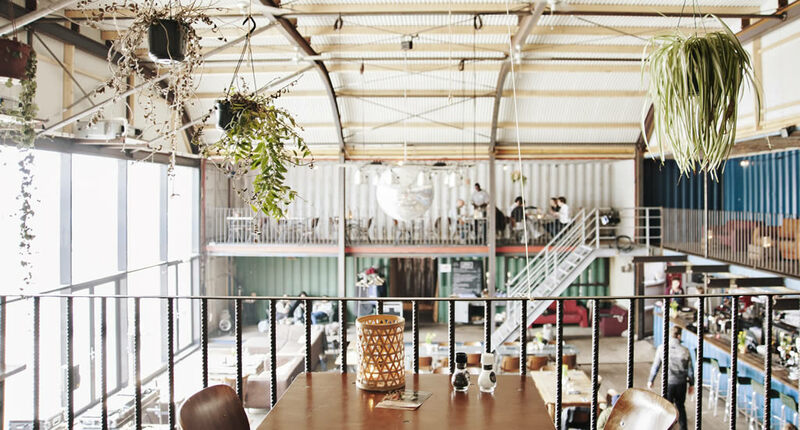 Amsterdam’s first food hall is housed in an old tram depot and the premises alone is worth the visit. But Hal no. 3 has so many restaurants and bars, that it will be hard to choose just one to eat at. The good news is: you don’t have to choose, you can simply sample something from different places. Brewery De Prael is not so much a brewery as it is a social initiative. The brewery works a lot with people that would usually have a tough time finding work. There are three branches in Amsterdam, the one at Oudezijds Voorburgwal 30 has the brewery which you can visit. A trendy and hip restaurant that hopes to finish food waste once and for all. InStock also has branches in Utrecht and The Hague, but the one in Amsterdam is the largest branch. Basically, you never know what you’re going to get, as the menu changes daily and is developed based on whatever harvest comes it. But trust me, the food is always surprising and tasty. 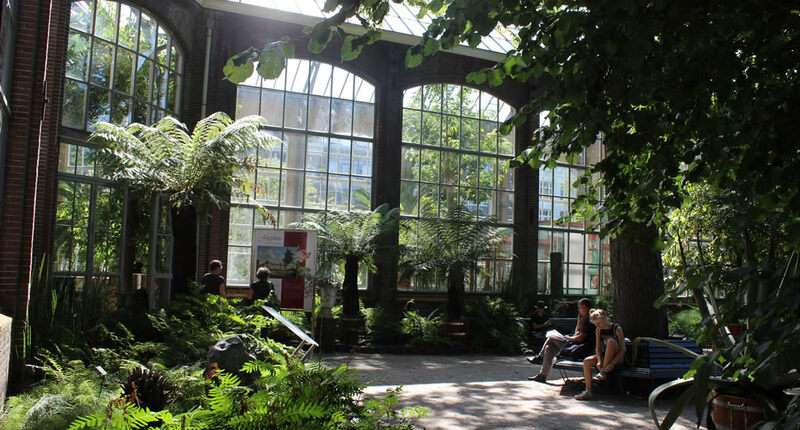 A bit of a tropical surprise in the heart of Amsterdam, with tropical plants and brightly coloured decor everywhere. All dishes are priced friendly and very tasty. Do try some of the Dutch beers and gins on the drinks menu. Dutch cuisine with a modern twist in a warm and cosy setting. Dutch cuisine may not be the most exhilarating in the world, but Lt. Cornelis proves that Dutch produce, like mussels, game and fish can be prepared to perfection. 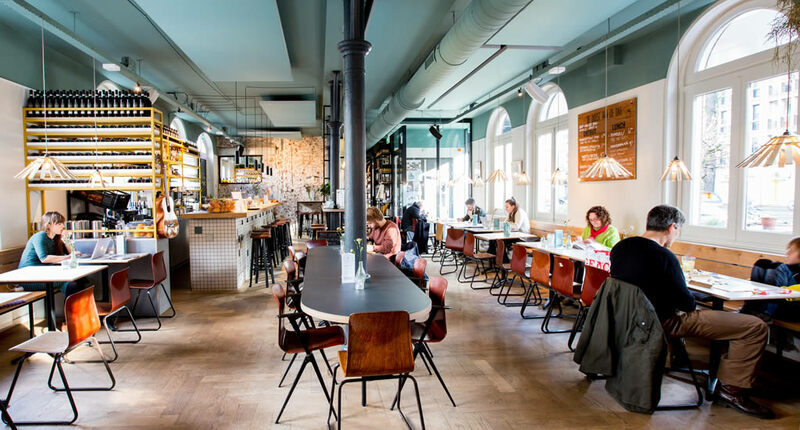 Book ahead to have dinner in this amazing Dutch restaurant, set in a beautiful gabled house. The best Dutch produce is combined into surprising and sometimes rather edgy dishes. Quite the surprise. We Dutch do pancakes pretty well if you don’t mind me saying so. And MOOK takes Dutch pancakes to the next level. Their stacks of pancakes with fruit, syrup or chocolate sauce (or all of them, why not!) are amazing. We Dutch also like savoury pancakes, so do try some pancakes with apple and bacon. That’s how we like them best! And if you can’t resist: have some poffertjes too. 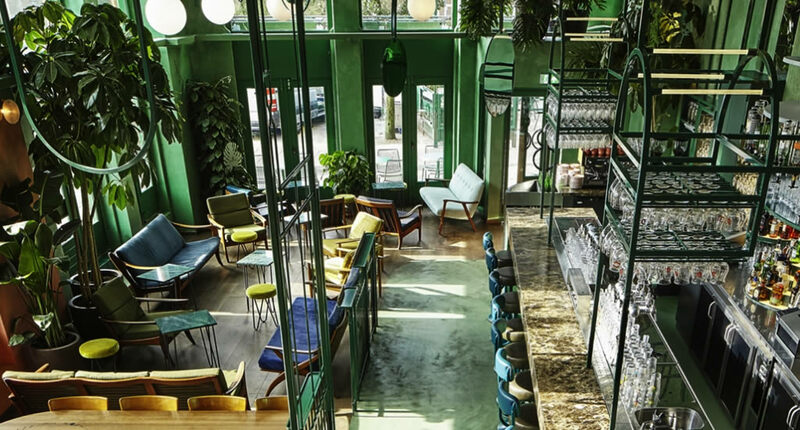 You won’t be short of good coffee in Amsterdam. But CT Coffee and Coconuts is a nice place because it’s set in an old cinema and the decor is pretty cool. The coffee is great and you can order a coconut for some extra hydration. This brand new hotel is set in an old newspaper building and therefore has a soft spot in my heart. But more importantly, it’s a very nice hotel and really affordable for Amsterdam standards. Old newspapers have been turned into wallpaper and the wood panelled decor has a lovely vintage feeling. But the rooms are nice and clean, and the rooftop bar is one of the best in Amsterdam. A little outside the city centre. But that’s more than okay. You can still easily reach the centre of Amsterdam by metro, train and tram (about 15 minutes) and you will get nice, spacious and clean rooms for a good price. This is such a clever concept. Students can rent rooms here when they haven’t found student accommodation yet. But there are also normal hotel rooms and even studios available. The hotel is very nicely decorated and you can always get a nice breakfast, lunch or coffee at the bar. On the south side of Amsterdam. You can easily get to the city centre by metro or train (10-15 minutes). 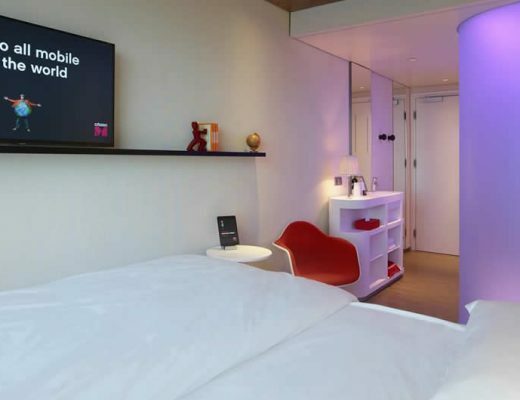 I think Citizen M has such a nice concept. The rooms are not too large, but they are yet so comfortable and cleverly decorated that you will hardly notice. Downstairs, the bar and restaurants offer a lot of space to simply read a book, chat with other travellers and relax. 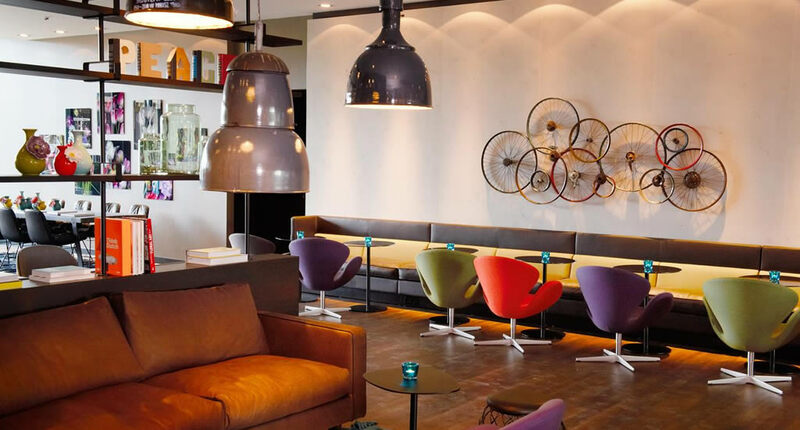 I find it amazing that such a cool design hotel in Amsterdam isn’t even that expensive, some rooms are even very affordable. All rooms are decorated differently and have unique Dutch features, like beautiful photos or rugs. The restaurant and bar are really good, so don’t worry if your feet are sore after a day of walking and you’d like to stay in for the night. Another plus, this hotel is really close to the city centre. 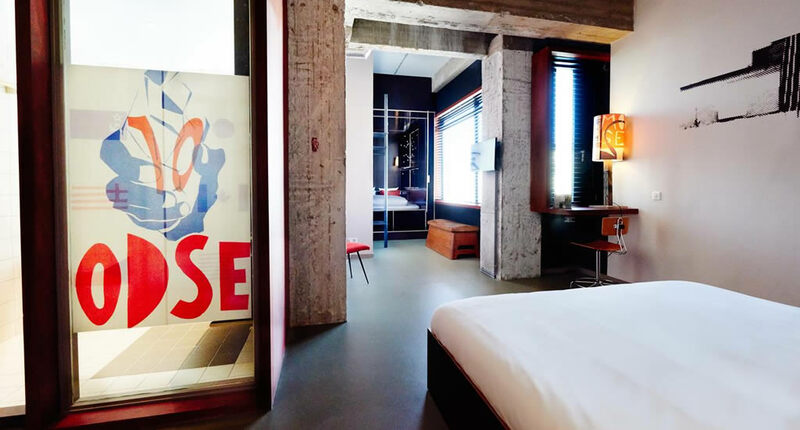 I love the QBic in Shoreditch in London and now Amsterdam has a QBic hotel as well. It’s located in the south of the city and you can easily reach the city by train or metro (10-15 minutes). All rooms are cleverly decorated and very bright. You can sit down for a nice breakfast every morning before getting into town. This hotel is pure class. It’s such a treat to stay here during your visit to Amsterdam. The hotel is in the middle of the city centre, set in a beautiful old newspaper office, which you can tell from the large printing letters behind the reception area and the old issues of the paper in the lobby and restaurant. The rooms are oh so nice and comfortable. 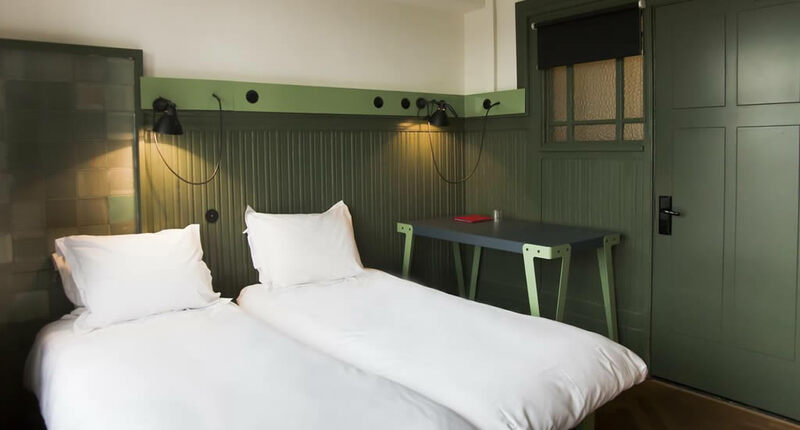 A brand new boutique hotel alongside a beautiful Amsterdam canal. Your stay won’t get more Dutch than this. The rooms are light, bright and comfortable with pastel and colourful details. In wintertime, it’s great to sit by the fire in the bar and warm up with a local beer. This hotel is so cool and so nice, yet so affordable. It’s set it a very hip neighbourhood near lots of great bars and restaurants, though the hotel has a very nice bar too. You can choose from so many different types of rooms. 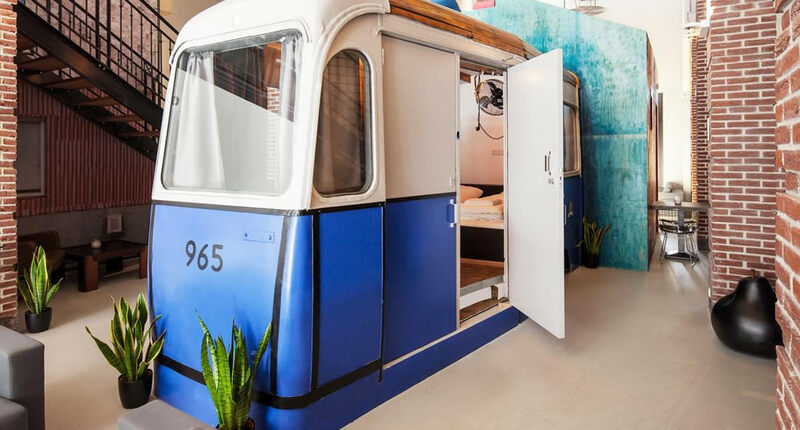 You can sleep in a tram boot to a large to a nice and spacious loft. Whatever you like.